Two sweet but not too sweet macarons have graced our house this week as it is almost MacTweet time. I have been on a macaron baking spree, as I want to perfect the baking of the macaron for Valentine’s Day gifts. When I get the idea to perfect something, I do it until it is right. You cannot tell from this batch but they were near perfect. Near perfect until I decided to photograph them on a slightly humid day last week. They barely withstood their photo shoot. No worries, though, they were delicious and both sets of our test tasters said they loved them. I have a feeling these recipes for Chocolate Macarons with Bergamot Buttercream and Vanilla Bean Macarons with Bittersweet Chocolate Cherry Ganache are going to be a keeper at Chez Us. The first recipe was inspired by our love of bittersweet chocolate and this wonderful Portuguese cherry liquor called Ginja or Ginjinha, I got to sample over the holidays. Ginginha is a sweet liquor made from the sour cherry-like ginja berry, sugar, and schnapps. As soon as I had my first sip I thought of bittersweet chocolate and macarons. I smuggled a small water size bottle home on the plane. Need I say more, chocolate and cherry just go hand in hand. The second recipe was inspired one of the best gifts I received over the holidays. Our good friend as well as Lenny’s cousin, Christian, gave us three precious bottles of pure essential cooking oil to use in our cooking. These oils are handmade by his father over in France and are used in some of the finest cooking at two of Boston’s top restaurants, the Clio and Uni. You see, up until a couple weeks ago, Christian was the GM at both restaurants and has been since the beginning. It is always a treat when we stop by as we are completely spoiled by the wonderful meals there but this time the spoiling was even better when he gave us three bottles of this very fine oil. I have been dreaming about all the things to make, but which flavor to use first ….. cardamon, citron or bergamot? After stumbling upon some fresh bergamot at the market it was an easy decision, I would use the essential oil and some zest from the fresh fruit to flavor this recipe. Don’t forget about all the other macarons that will be out there in the MacTweets virtual pastry shop, be sure to hop over and indulge! Mix 35 grams of sugar with the water and zest and bring to a boil in a heavy saucepan. Stir sugar until it boils. Using a candy thermometer, continue to boil until 121°C / 249°F. Meanwhile, beat the egg whites with an electric mixer in a clean bowl on medium-high speed until frothy. Add in the cream of tartar, and continue to whip until soft peaks form. Add the remaining sugar and continue to beat until stiff, and glossy peaks form. When the sugar reaches 121°C / 249°F, remove it from heat. Reduce the mixer to medium-low and slowly pour the syrup into the egg whites in a thin stream between the whisk and the side of the bowl. Be careful not to splash the hot syrup or your buttercream may form small sugar crystals in it. Return the mixer to medium-high, and continue beating until the mixture is fully cooled. About 15 minutes. Reduce mixer speed to medium and gradually add small amounts of the butter, but only as much as it can be absorbed into the mixture before adding the next amount. Continue to beat until the buttercream is smooth. About 15 minutes. As the buttercream solidifies, add 1/2 teaspoon essence oil and beat into the mixture for an additional minute. Use the above recipe for the cookie part of the macaron. Leave out the chocolate. I added a small amount of paste food coloring as I wanted a pink tint as well I added the seeds from 1/2 of a vanilla bean. Put chocolate into a mixing bowl and pour the cream over the top. Let sit for a couple minutes. Stir until melted. Add the liquor, stir well. Let sit in the refrigerator for at least an hour before using. 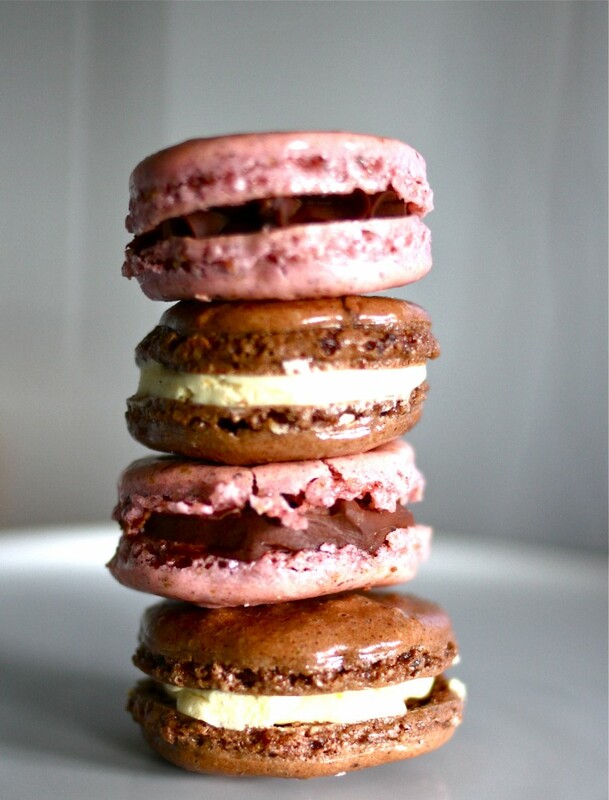 13 Responses to "Chocolate Macarons with Bergamot Buttercream and Vanilla Bean Macarons with Bittersweet Chocolate Cherry Ganache"
These sound wonderful. Can I make them without hazelnuts? Oh these are gorgeous and so romantic for Valentine's Day. Lovely! hot looking macarons and simply irresistible! Wow, those macarons look absolutely beautiful! I do have hazelnuts and almond flour that need to be put to some good use like these! Thanks for the post! Your macs do look perfect! I had to Google bergamot because I had never heard of it before. I sounds like a flavor I would love! i so want to get my hands on the cherry liquor you just described. Chocolate and cherry is a match made in heaven! I found your site on Foodista and how happy I am! You site is so nice and your recipes look delicious! Cheers friend! I've been looking for a source of Bergamot oil/essence - I can't find any in the UK suitable for cooking. Could you advise whether Christian's father has a website through which he sells these oils? Or if not, have you used a supplier before that you would recomend? Thanks!